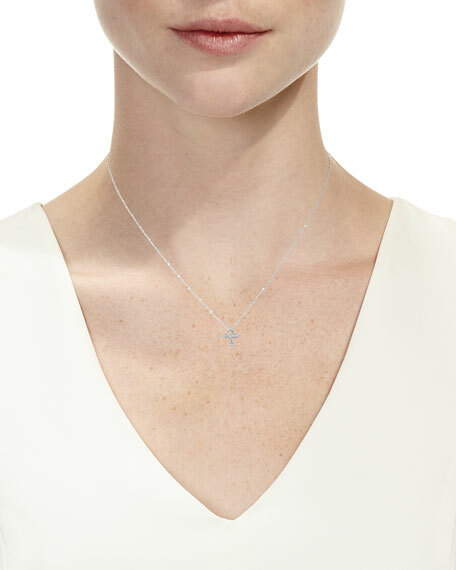 JudeFrances Jewelry pendant necklace from the Provence Collection. 18-karat white gold Boston chain. 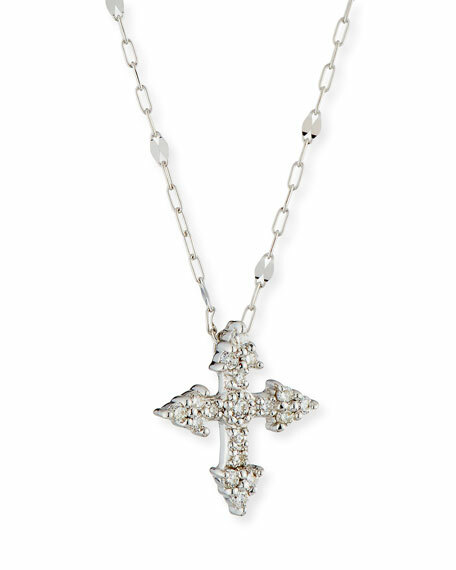 Tiny cross pendant with multi-size round white diamonds. Combining classic elegance with on trend shapes and styles, JudeFrances Jewelry offers something for women of all ages. Each JudeFrances woman creates a jewelry wardrobe reflective of her own personal style. The JudeFrances Earring Charm Frame, adding another component to the ever popular hoop and charm silhouette. The frames stand alone as a charm or can be combined with any JudeFrances hoop and charm to create a look unique to the collector. Substantial silver cuffs and stackable 18K gold bangles complement the feminine earring looks. Glistening gemstone layering chains complete the fresh look of JudeFrances. For in-store inquiries, use sku #2553279.